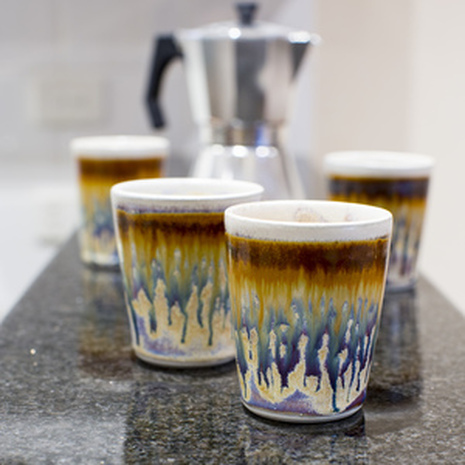 I’m a ceramic artist living and working in Adelaide, South Australia, originally from Port MacDonnell in Southern SA. My journey with clay began in 2004 while undertaking a ceramics foundation class at the University of South Australia, Underdale campus. 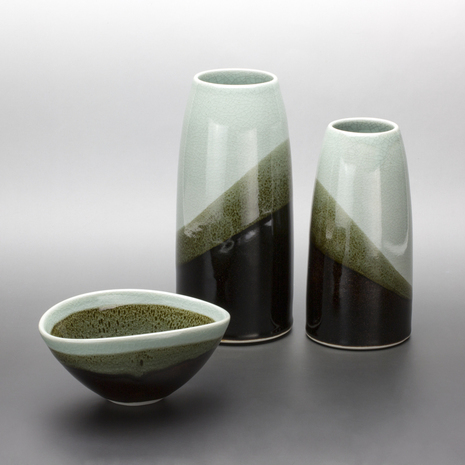 I became fascinated with glaze chemistry after dabbling with Raku firing and being introduced to traditional Japanese, Korean and Chinese glazes and production techniques. I completed a Bachelor of Visual Arts (First Class Honours) in 2007 specialising in ceramics, followed by Graduate Diploma of Visual Arts (Masters by Coursework) in 2009/10, and have since worked as a ceramics tutor and artist from my home studio established in 2012. I create wheel thrown vessels and functional pieces in porcelain and stoneware, implementing a wide range of high-fire gas reduction glazes which I have developed over the years. I strive to evoke through my work a sense of the natural and organic; sometimes muted and understated, but predominantly colourful, playful and vivid. I am particularly inspired by the historic spiritual connections we have with our natural environment, and explore this theme in various ways through my exhibition work. My obsession with glaze chemistry informs much of the development of my work, with each firing leading to new discoveries and possibilities. I love to explore the limits of the materials I use, and in doing so create a number of one-off pieces which are difficult to replicate, making each piece entirely unique. It is this endless process of experimentation which I find very exciting and fulfilling.